Most of us rarely think about snot or mucus production. Yet, it is always present. What is the point of having this viscous substance? Typically snot/nasal mucus is clear. This is because it has a high water content that also contains proteins, dissolved salts, and other products of the immune system. 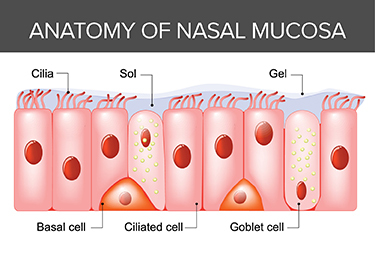 When the movement of mucus slows within the system, the mucus can become white as it loses moisture and becomes thicker and cloudier. The mucus may turn yellow as white blood cells congregate to particular sites. When the white blood cells are spent they become part of the mucus giving it a yellow color. The more white blood cells you have congregating, the more likely the mucus may become greener in color. Occasionally, mucus becomes pink or red indicating that it is mixing with capillary blood. This often occurs when the respiratory mucosa becomes dry, irritated, or damaged. Sometimes the mucus may become brown from dried blood or, more commonly, from the inhalation of dirt. Jessica Pizano is the owner of Fit to You, LLC, which offers clinical nutrition and nutrigenomic counseling, as well as personalized training programs. She earned a master's degree in human nutrition that emphasizes functional medicine at the University of Bridgeport and is a Certified Nutrition Specialist (CNS) practitioner through the Board for Certification of Nutrition Specialists. She is pursuing a doctor of clinical nutrition at Maryland University of Integrative Health where she also teaches a graduate level course on nutritional genomics. A certified personal trainer and a corrective exercise specialist through the National Academy of Sports Medicine, she is also certified in mat Pilates through PHI Pilates and earned her Clinical Exercise Specialist and Longevity Wellness Specialist through the American Council on Exercise. Currently, Jessica practices nutrition counseling, nutrigenomics, and personal training in her studio in Avon, Conn.
Marieb EN, Hoehn K. Human anatomy and physiology. 8th ed. San Francisco: Benjamin-Cummings Publishing 2010. Spronsen EV, Ingels KJAO, Jansen AH, Graamans K, Fokkens WJ. Evidence-based recommendations regarding the differential diagnosis and assessment of nasal congestion: using the new GRADE system. Allergy. 2008;63(7):820-33. Yeo N-K, Jang YJ. Rhinovirus infection-induced alteration of tight junction and adherens junction components in human nasal epithelial cells. Laryngoscope. 2010 Feb;120(2):346-52.